In previous articles I have described the challenges resulting from incomplete progression of infant reflexes, and how “retained” reflexes are at the core of many academic and behavior issues. Here is the story of a profound shift experienced by a client, in addressing Symmetrical Tonic Neck Reflex. For more on reflexes, please see the Resources listing at the end of this article. What follows is an updated version of an article that originally appeared in my newsletter. Did you ever wonder how an infant performs the remarkable feat of getting from his tummy up onto hands and knees? It’s actually thanks to the specific “wiring” period of Symmetrical Tonic Neck Reflex - STNR), which emerges at about six to nine months of age. To understand this achievement, let’s first back up to an earlier point of life. The infant’s initial shaky efforts to lift his head from a tummy-down position typically occur by about six to eight weeks after birth. By three to four months of age, the infant will likely be able to raise his head and keep it up, as he looks around his world. The baby may stabilize himself with his arms. Then, at about six to nine months of age, this very same lifting of the head will begin triggering spontaneous, reflexive movements elsewhere in the body: the arms straighten, and the hips and legs flex. Eventually this action will bring the baby up into a “sitting-cat” position. And he’s up! Conversely, when he tilts his head down, the opposite actions reflexively manifest: his arms bend and his legs straighten, elevating his rear end. Over time, these movements are refined into a fluid motion that brings him up from his tummy into a stable all-fours posture, in preparation for crawling. This particular reflexive action (arms or legs straightened or flexed) in response to head movement (forward or behind the midline of the body) is called Symmetrical Tonic Neck Reflex (STNR). By the time the infant is about nine to eleven months of age, this reflex will have done its work - baby is up, and able to stabilize in an all-fours position - and his head movement no longer triggers automatic bending or straightening of his arms and legs. Soon he's ready for independent crawling, which learning specialists agree is a foundational action that promotes cross-lateral integration: coordinating the movement of both sides of the body requires coordinated use of both brain hemispheres, which is also vital for easy learning. However, for various reasons, not all infants go smoothly through the STNR stage, and vestiges of this reflex may be “retained” – through childhood and even into adulthood. 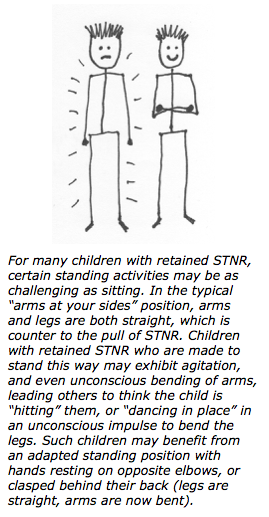 One of the most common results of retained STNR is the inability to comfortably sit still. How could this be? Let’s explore the principle at work. Reflect for a moment on how a child is expected to sit at his desk in school. To sit “properly” on a chair, his knees must bend. However, the STNR pattern would then prompt him to straighten his arms. He must bend his elbows to be in the “proper” position for reading a book or writing, but this would prompt him to straighten his legs. 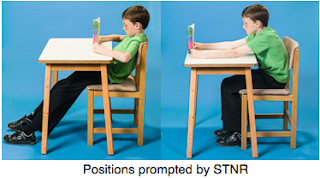 Add to this the action of tilting his head up to see the board, and then down to focus on his work, and his retained STNR may be triggered even more. When a child with retained STNR must sit with arms and legs both bent, he often ends up uncomfortable, agitated—and potentially labeled as hyperactive. In fact, ­­the authors of Stopping Hyperactivity—A New Solution describe “immature STNR” as a prime cause of ADHD diagnosis. As a career K-6 educator, I can attest to being utterly mystified by the odd postures children would assume at their desks. Some wanted to read or write slumped over, with their arms out straight in front of them. I would constantly remind them to “sit up straight and put your paper (or book) right in front of you.” Others persisted in sliding down in their chair with legs straight and angled out in front of them, even finding something to use as a footstool. I would tell them to “put your feet under your desk.” Little did I realize that these students had gravitated into the only postures where the strain of Symmetrical Tonic Neck Reflex would be relieved, and they could actually do what I really wanted them to do — focus, read, write, and learn. I see now that these children were very creative problem-solvers. It was only my lack of understanding that prevented me from appreciating their behaviors as a search for release of inner tension, from what I call “the pull of the invisible puppeteer” that results from retained reflexes. Numerous educators I've talked to describe what they see as a 'growing epidemic of hyperactivity" in children. Could it be that many more children than ever before have retained STNR? And if so, where could this be coming from? I have a theory: some infant-care practices adopted in recent decades prevent children from being on their tummy as much as was historically the case. A generation ago, infants spent huge amounts of time on their tummy — both sleeping and playing. With the "back to sleep" movement (an important recommendation by doctors to reduce the chance of SIDS, Sudden Infant Death Syndrome), parents now consistently position infants on their back for sleeping. However, over-cautions parents may translate this into a practice of never putting infants on their tummy. In some cases, infants even end up with “positional plagiocephaly”—they are positioned on their back so much, the back of their head actually becomes flat from constant contact with the surface beneath it. Then there’s the prevalence of baby carriers. The development of infant car seats is an incredible boon for infant safety; they must be used when the infant is in a vehicle. However, because car seats now come with handles, parents have begun carting their infants everywhere in them. One mother I talked to realized that her son had been in his baby carrier for more than eight hours that day, what with her commute, many errands, lunching with a friend—and simply setting the baby in his car seat next to her desk while she worked. These carriers have become a convenient means of managing infants. Is their over-use preventing infants from getting the tummy-time (not to mention vital human touch and variety of physical movement) they need? • What does it feel like to orient myself this way? • How is my view of the world different from this position? • How is the pull of gravity different, and what does it take to raise my head? • How different is it to feel the solid earth under my tummy? All of these experiences build vital aspects of her relationship to the world around her, creating an integrated developmental foundation for new movement patterns. Then, six to nine months after birth, the Symmetrical Tonic Neck Reflex emerges, and when the infant raises her head she automatically pushes up with her arms; eventually her legs bend as well, and sheʼs soon up on all-fours, as described in the beginning of this article. I wonder: If a child never has sufficient tummy-time, is it even possible for her to appropriately engage the STNR, rise onto all-fours, learn all the vital brain-wiring lessons from months of cross-lateral crawling—and, then, appropriately graduate to walking? Will her mind-body system be waiting a lifetime to fully “use” the STNR, so this reflex pattern can be incorporated into more mature, intentional movement, as the “trigger” for this reflex simply fades away? Time, and research, may tell. In the meantime, however, our world is full of children (and adults) who daily experience the stress of retained STNR. How much better it would be if intervention was never needed in the first place. But Iʼm grateful that STNR often responds quickly to specialized Brain Gym/Edu-K processes. I recently worked with “Ronny,” a very bright, likable boy, whose teacher was amazed (and frustrated) by how agitated he was when sitting, and how poor his focus was. Now in eighth grade, Ronny was still struggling to achieve academically. I had worked with him several times over the last few months, addressing different aspects of reading and focus, and after each session he showed progress. However, he still lacked the ability to sit quietly and work as well as was necessary to succeed at that grade level. “When I sit down, I canʼt focus at all. Iʼm much happier standing. At home, Iʼve found the best place for me to do my homework is standing and using the ironing board as a desk.” We created a goal for his balance, which was to “sit comfortably while I focus and learn.” Not surprisingly, of all the processes available on my Brain Gym/Edu-K learning menu, he intuitively chose the one that addresses Symmetrical Tonic Neck Reflex. This made so much sense! If Ronny had a retained STNR, he would feel agitated when sitting with both his arms and legs bent. Standing at the ironing board, his legs would be straight, but his arms would be bent so he could hold a book or write. He had found the perfect physical posture to relieve himself of the pull of the invisible puppeteer. I led Ronny through some pre-checks to determine if STNR was present. One involved seeing if he experienced stress while sitting or standing. (This was determined through the Applied Kinesiology process of “muscle-checking,” which challenges the ability of a muscle to “hold” in certain positions, revealing aspects of systemic stress.) When seated (legs bent) he was stress-free only with his arms straight; when standing (legs straight), he was stress-free only with his arms bent. No wonder he felt so agitated when he had to assume a typical seated posture! The process Ronny had chosen from the learning menu was Total Core Repatterning, a technique developed by Dr. Paul Dennison (which he teaches in a course by the same name). Following this process, we rechecked Ronnyʼs postural stresses. While these checks did not indicate that the reflex was completely resolved, they showed there was great improvement. Following this session I had a discussion with Ronnyʼs teacher. I explained to her how a retained STNR results in the inability to sit still and focus, and how she could help Ronny learn more easily by creating a space where he could do his work standing up, perhaps in the back of the room. 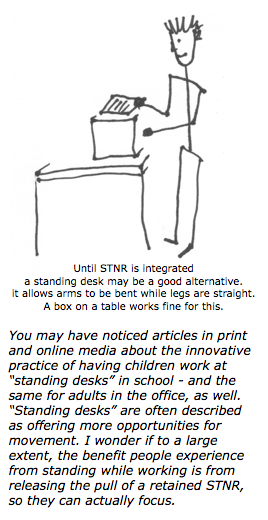 She immediately grasped the concept and created a "standing work space" by placing a box on top of a table, to position Ronny's work at just the right level for him. She also gave him permission to move from his desk to that standing work space as needed. When I worked with Ronny again two weeks later, he was excited to report all the positive changes he'd experienced since our last session. He was very pleased that his teacher was allowing him to stand at the back of the room to do his work, but said that he didn't always need to, and that sitting was much more comfortable than ever before. He also said that he has much better comprehension when he reads, and is even passing more tests. He had just received a social studies test from his teacher, and had earned 100% on it. We definitely celebrated all these changes! In this session, Ronny wanted to continue his focus on sitting comfortably. The postural prechecks from our last session still showed a stress response, and Ronny again chose Total Core Repatterning from the learning menu. This time when we were finished, his post-checks were solid: sitting or standing, he showed no stress at all, whether his arms were straight or bent. He was delighted! Three weeks later, both Ronny and his teacher reported that he is much more able to sit still in the classroom, and his focus has improved as well. Ronny told me that he no longer feels the need to stand or move around in order to concentrate; he is perfectly comfortable and focused doing his homework sitting at a table. He no longer has to stand while reading and writing, because the former agitation from sitting is simply gone. Ronny will still benefit from additional sessions to address other areas of learning challenge, but this STNR shift will certainly go a long way toward providing a new, more integrated foundation for all his future changes. • To learn more about how reflex continuum delays may manifest in children and adults, as well as interim management and coping strategies, I highly recommend the book Learning, Reflexes and Behavior: A Window Into the Child’s Mind, by Sally Goddard. 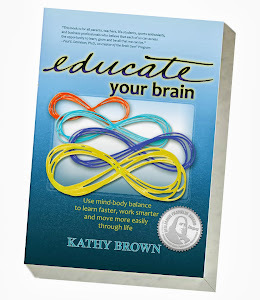 • Chapter Eight of my own book, Educate Your Brain, is an overview of infant reflexes. • These links will take you to articles on my blog and past articles from my newsletter, all pertaining to infant reflexes. ©Copyright 2016 Kathy Brown. All rights reserved. Original article ©Copyright 1999 Kathy Brown. All rights reserved. Infant STNR drawings ©copyright RMTi. Used with permission. Seated Student STNR photos ©copyright Laird Brown Photography. All rights reserved. Line drawings ©copyright Kathy Brown. All rights reserved.